You can view data for three different hardnesses. 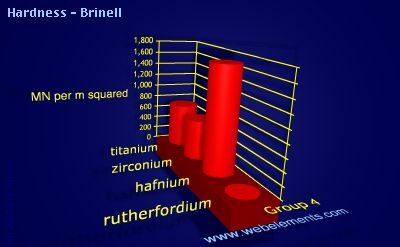 Image showing periodicity of hardness - Brinell for group 4 chemical elements. Where a range is given in ref. 1, a rough estimate is quoted, all at 293 K wherever possible. Values are often vary wildly and are dependent upon the way by which the sample is made (cast, annealed, quenched, strained, etc.). It would be unwise to make assumptions about the hardness of any sample you might have upon the figures given here. Values decrease with temperature. Consult reference 1 for further information.